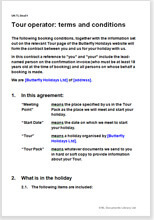 Comprehensive terms and conditions template for a travel company or tour operator where clients organise their own flights and travel to the meeting point. It can be easily customised to your precise requirements, whether you offer walking tours, weekend breaks, or much longer holidays in Europe. This template complies with the Consumer Guarantees Act 1993 as amedned, and other latest consumer protection legislation allowing you to sell to businesses or consumers. Other miscellaneous matters to protect you.